One glimpse of teenager Ian's bedroom in "Mid90s," Jonah Hill's first feature as a director, and you don't even need the title to place you in a specific time. Carefully organized CDs line the shelves. Source magazines sit on the bedside table. There's a poster for the Wu-Tang Clan on the wall, and immaculate Air Jordans in the closet. This is the detritus of an era, not too far past, but far enough it's like an archeological dig into the world right before the Internet connected all of us, for better or worse. The objects have a sacral glow, especially since Ian—played by Lucas Hedges, who is proving an extremely versatile young actor—guards his room so ferociously. Ian is the older brother of the central character, middle-school kid Stevie (Sunny Suljic). Stevie, abused by his brother on a daily basis, raised by a mother (Katherine Waterston) too self-obsessed to see what's going on in her own home, drifts into the company of a group of older kids whose lives revolve around skateboarding. 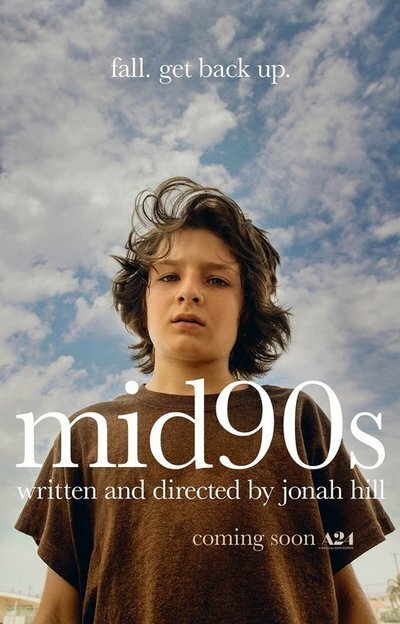 The strength of "Mid90s" lies in its small observations about a very tight sub-culture, and what that sub-culture provided its most devoted adherents. Stevie is first seen being beaten up by Ian. We don't know why. Throughout the film, variations of this scene repeat, giving the brothers' fights a ritualistic aspect. Ian, wearing a Bill Clinton mask, ambushes Stevie, chasing him through the house, punching and pummeling him. Stevie doesn't question this. Ian is practically non-verbal. Mom doesn't notice something is "off" in her sons' relationship. One day, Stevie catches a glimpse of a group of four rowdy kids holding skateboards, sassing back to a storeowner. Something about the boys attracts him, and he wanders into their group, trying to get closer. These boys, in their later teens, around Ian's age, sit around in a ramshackle storefront skateboard shop. Their dynamic is a closed system, but they accept Stevie's presence, and let him hang out with them. Stevie doesn't know how to skate so he practices at home in the driveway, falling constantly. The older boys are fluid on their skateboards, flying up stairways, careening along railings, and thinking up different tricks to do to prove their own skills and daring. Most of these kids have almost no film or television credits to their names, making Suljic the veteran of the group. But their dynamic —free-wheeling discussions, razzing each other, talking stuff out—really makes the film, immersing us fully into the skateboarding world as experienced by this specific group. They seem like they've been friends since kindergarten. Hill has always used improvisation in his own work as an actor, and trusts that process with the actors here. Nobody "gives a performance" in the self-conscious sense of the word. Hill leaves them alone, letting them be onscreen, not trying too hard to build conflict. Ray's seriousness about skateboarding starts to drive a wedge between him and the more easygoing Fuckshit. We are seeing them in the moment before they all part ways. In one sense, the character of Ruben—young and yet old from experience, insecure, terrified of not seeming "cool," embarrassed by Stevie's openness—is central to the film's apparent subtext. The boys are teenagers, yes, but this is when things start to go wrong for people, when they start to build protective armor they won't be able to shed. Ruben is trapped by the attitudes about manhood, and he doesn't even know it. Ray is unhindered by the same attitudes. More could have been made of this dynamic and the script is repetitive: there are one too many Stevie pep talks, for example, making you wonder if Ray has nothing better to do with his time than talk this kid through his problems. Sometimes what has been left out of a story is as important as what has been left in. Here, Hill leaves out explanations (What the hell is going on with Ian? ), and doesn't psychologize. Clearly many of these kids come from bad situations. One is virtually homeless. Why they put up with Stevie tagging along is also not really explained. He can't skate, he can be a drag because they have to look out for him, he hurts himself pretty badly because of his high tolerance for pain (he's been trained well by his brother). But Hill's withholding of easy explanations is why the film works when it does work. There are a couple of moments of pure beauty, the boys weaving on their boards down a busy median strip, like graceful pilot fish backdropped by a pink sunset. Other than that, the film has a no-nonsense almost lo-def look. Along with a score by Trent Reznor and Atticus Ross, the soundtrack is populated by hits from the mid-'90s, a vibrant time in music, when the Top 40 rules were broken, ushering in new voices and energies. Hill's touch with the material is light, almost gentle. He doesn't push for universal relevance (the title notwithstanding), and he doesn't push for catharsis. It's clear that Stevie will move on from this scene and these people. He's a visitor, not a resident. While it's refreshing that Hill avoids some of the cliches inherent in the material (Stevie does not suddenly become a star skateboarder, find self-confidence, gain the admiration of his peers/girls/mother), the film's rough edges sometimes feel like a first draft.